Mughlai paratha is deep fried bread stuffed with egg, onion, chillies and sometimes meat mince. Meat mince will be spoonful in each paratha. I have not used meat today. But you want to add meat. Cook minced meat with pinch of garlic paste, ginger paste, black pepper powder, chilli powder, garam masala powder and salt; and add like onion and chillies. If you are adding meat, use mint leaves instead of coriander leaves. Enjoy. Mix salt water (about 1/3 cup) and add salty water and flour to make soft dough. Add oil and knead well till oil is absorbed by flour and rest for at least 10-15 minutes. Divide the dough into 2 and roll each of them into thin bread using oil (don’t use flour). Break an egg and pour over the bread. With your finger spread egg over the bread and sprinkle onion, chillies, coriander leaves and salt over it. 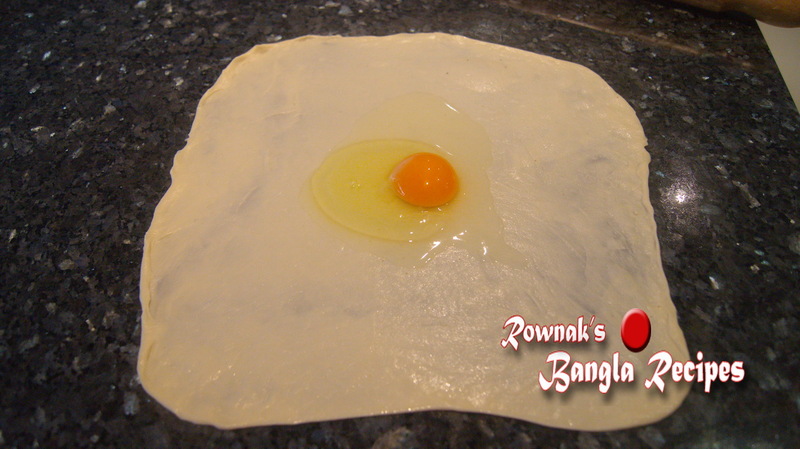 Now the most important fold it, for first fold make sure it overlaps otherwise egg comes out. Check picture for folding. After fold you will get a square size paratha. Heat the oil, when oil is ready, place it gentle in oil and fry on medium heat. Fry till it becomes golden brown in both sides. Remove from oil and place on paper tissue and repeat the process with other dough. 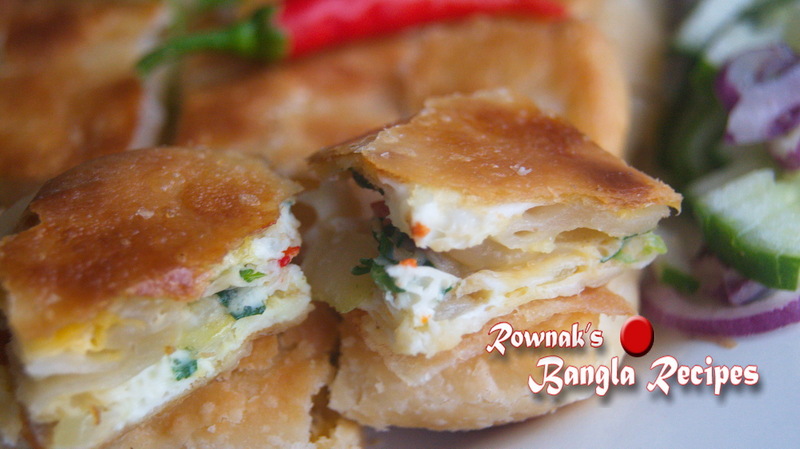 Cut into bit size pieces and serve mughlai paratha hot with cucumber and onion sliced or with your favourite sauce. Make sure 1sst fold overlap each other. Resting dough is very important. After certain size of roll, I find easy to stretch it with hand. Stuffing and folding process need to be quick.